To entrust an increasingly sceptical public with more and more veto powers at the very moment when existing veto powers threaten the EU project - does not seem right. The Vienna Policy Conference, October 29-30, 2015, will delve into one of the most important trends driving change in European politics: the dramatic drop in public trust in many political institutions. Policy researchers, activists, leading European thinkers, and political figures will discuss new research and analysis of the causes and consequences of the trust gap across the European continent. Debating Europe and openDemocracy will be covering the event and its follow-up, and we continue the series with the perspective of Alina Mungiu-Pippidi, principal investigator in a report on integrity and trust in Europe for the 2017 Dutch EU presidency. 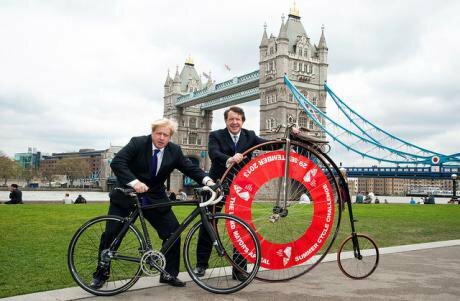 Boris Johnson and Roger Gifford launch Lord Mayor's Summer Cycle Challenge, 2013. Flickr/ MichaelBowles/Rex Features. Some rights reserved.Until the latest refugee crisis, the Eurobarometer question on attitudes towards migration would have been discarded in any sociology classroom, as it actually prompted respondents to concede that migration was needed to cover the EU’s demographic deficit before measuring their genuine opinion about it[i]. Only in 2015, when things got out of control, did EU pollsters, famous for allowing commissioners to write unprofessional questions, allow migration to be raised as the number one concern in the regular Eurobarometer survey. Moreover in 2015, corruption no longer featured among the first ten concerns of Europeans, despite the fact that specially commissioned expensive surveys by those responsible for the European Anticorruption Report had found only 1-2 years before that three out of four EU citizens thought that bribery and the use of connections are ‘often’ the easiest way to obtain ‘certain’ public services in their country. (Had this been the case, Europe would have fallen to the same levels of corruption as sub-Saharan Africa.) Long before the current trust crisis, the EU seems to have lost any objectivity in inquiring what people really think about our problems, let alone the capacity to process their responses. Since 2011, European citizens have been losing faith with the European project. Citizens are split, with around half feeling that their voice counts in the EU, and half feeling the opposite. While trust is generally higher in newer member states – such as Romania (62%), Ireland (57%), Lithuania (55%), Bulgaria (55%), Poland (53%) – clear majorities of respondents in Mediterranean countries (Cyprus, Greece, Spain and Portugal), have profoundly lost trust in both European and national political institutions since 2007. EU institutions themselves have lost on average more trust than national institutions, with sub-national governments the most trusted. The literature also shows that EU citizens are in fact more likely to show greater approval of the EU when their trust in their own national institutions is low and vice versa, since they perceive the two centres of authority as alternatives. If one’s national government is incompetent or inefficient perhaps EU policies will be able to issue some correctives from above – or so runs the argument. If, however, national institutions appear to perform well, citizens may fear that transferring sovereignty to the supranational authorities of the EU will result in a compromise with less well-performing countries, bringing a subsequent loss of both efficiency and integrity. The EU is not a popular democracy - such was not, after all, the intention of its founding fathers. Jean Monnet recounts in his memoirs that the founding idea originated in the First World War and that the goal was to pool resources to enable the repulse of an enemy under a unified command - because coordination was failing to deliver under such conditions[ii]. It still fails. Ghita Ionescu, the founder of the London School of Economics journal Government and opposition wrote more than twenty years ago[iii] that the democratic deficit predated the European Union, caused by the specialization of knowledge and increase in the power of experts on one hand, and on the other by the transnationalization of what had previously been national matters. Consequently, it became impossible for governments to act alone even after the “fullest consultation of their peoples”. In 2004, the number of Europeans who believed that their voice counted in the EU was 39%. Ten years later, after the powers of the European Parliament have greatly increased, that figure has dropped to 29% (those who feel disempowered have increased from 52 to 66, an even greater difference). In other words, a majority always knew that the EU was not a popular democracy from the outset. Even in 2004, for every European who believed he had a voice in the EU two believed that they had none (Eurobarometer 2013a). Apart from Denmark, where an absolute majority believe that their voice counts in the EU (57% vs. 41%), in 26 countries people believe they have no influence in the EU in proportions that vary from 50% in Sweden and 51% in Belgium, up to 86% in both Cyprus and Greece - for obvious reasons. But there is nothing new here, except, of course, the terrible constraints that the euro crisis has imposed on Greece, Cyprus and other countries, a tragedy caused by the complexity of an interdependent world which makes people less and less able to decide their own fate. In such complex situations, it is only the populists who offer simple solutions for how to empower voters. We do know what has caused the loss of trust: over two generations a significant question mark has arisen over whether the EU is the best vehicle to maximize social welfare for its various peoples. On one hand, there is the EU’s economic performance since the advent of the economic and growth crisis. On the other, there is loss of trust in European elites, perceived as demanding austerity from the people only to live a life of privilege themselves where taxes are concerned. Between 30 % and 40 % of Europeans complain about favouritism (special advantages) in service provision. The perception that special advantages are often given to certain individuals or groups is particularly widespread in assessments of public healthcare systems. The sizeable percentages even in northern and western Europe of 28 % and 36 % respectively perhaps indicate the difficulty of public healthcare provision in times of budgetary austerity. As to southern and central and eastern Europe, figures there suggest the presence of policy failure, with 42 % and 49 % of respondents complaining of favouritism. With a European average of 41 % for healthcare systems this already stands as a warning that any decrease in the quality of governance subverts trust. In new member countries, a majority exists that believes that favoritism is the rule of the game in their societies. Furthermore, trust in the EU is significantly associated in our statistical models by the subjective assessment of how governments deal with this corruption. But neither problem is easy to tackle. Undoubtedly, since the beginning of the economic crisis, Europe has lost a significant amount of the confidence of its citizens, and at first sight it is tempting to argue that a reflection of that can be seen in the gradual decrease in turnout at European elections, or in the increase in votes polled by populists, (although the evidence shows that populists are better explained by the national failures of some traditional parties than any pan-European explanation). The erosion of trust and reduction in participation and mainstream preferences seems to threaten the imminent ruin of European democracy and legitimacy; it might even put a stop to the European project itself. But the solutions to this as currently debated seem to derive from some public relations (PR) menu for democracy, in which we need to entrust an increasingly sceptical public with more and more veto powers at the very moment when the already existing veto powers threaten the EU project. Somehow this does not seem right. Of course, there is no PR substitute for solving the problems. Some may argue that fixing Europe is about performance, not democracy: people will like European elites again when they prove to them that they can handle the euro and the migration caused by the failure of democratization in the Arab countries, two problems that western leaders made worse, if they did not altogether create them in the first place. Fix them, and we shall be safe - this was not a union for better as well as for worse. But as we might not be able to fix them, we might as well apply ourselves to addressing the other problem. The current crisis in trust was to a certain extent brought about by the contrast between the demands of austerity as laid upon the shoulders of EU citizens and the self-serving behavior and flouting of rules engaged in by politicians. Some people will argue that times of austerity require elites - especially politicians - of austerity. But a change of image among EU politicians, to be more like those in countries where trust is high, who fly economy class and cycle to the office, might do much to restore trust. Hard times are easier to bear when governments make a shift to share the burdens that weigh upon the governed. These, and other suggestions will be aired at the Conference ‘Rebuilding Trust in Europe’ organized by the Open Society Foundations and ERSTE Stiftung on 29-30 October in Vienna. [ii] Monnet, Jean (1978) “Memoirs. The architect and master builder of the European Economic Community”, Garden City, New York: Double Day. [iii] Ionescu, G. (1989) “Political under Comprehension, or the Overload of Political Cognition”, Government and Opposition, 24(4): 413–26.